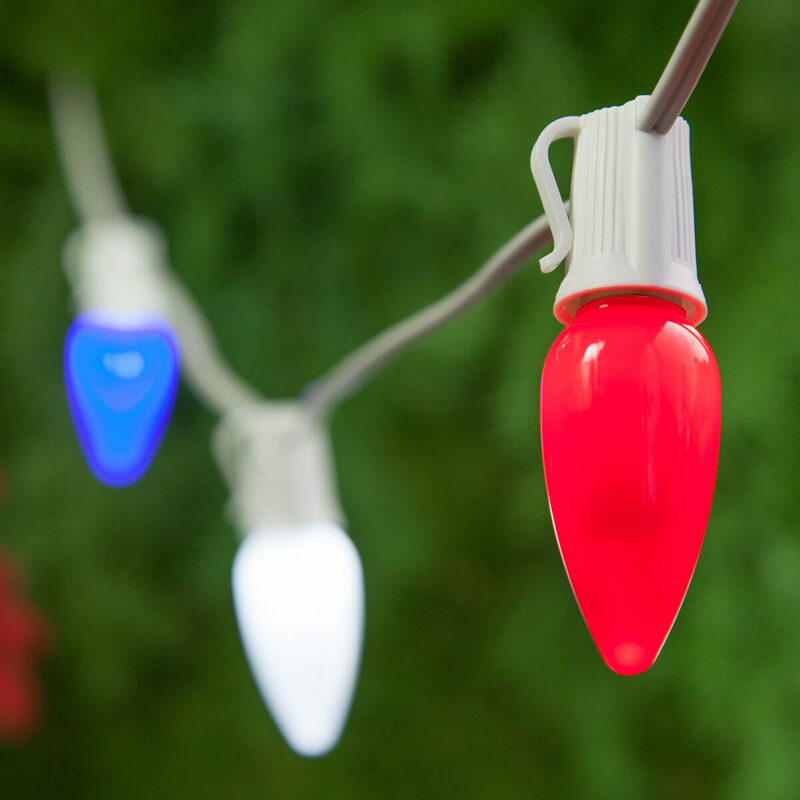 What makes LED string lights so great? There's a divide in the world of string lights and it all comes down to one question. People have been taking sides since the very beginning. Those enthusiasts who love incandescent bulbs for their nostalgia and warm glow have been unconvinced by the promise of energy savings and the flashy brightness of LED lights. Until now. With recent advancements in technology, even the diehard lighting purists of the world are making the switch from incandescent to LED. Why you ask? Because LED bulbs offer way more than a few dollars saved on your energy bill. 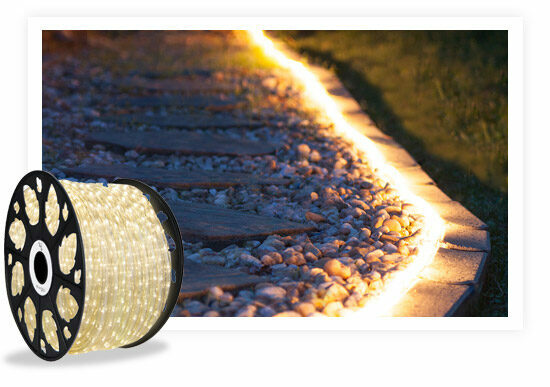 Beautiful & Bright - Customers love the bright light output of LEDs, especially in outdoor settings. But they also love the variety of color tones and bulb designs that allow for the diffusion of light to produce that warm glow that makes incandescent bulbs so special. Seriously Long Life - LED bulbs last a really really long time with most LED string lights being rated for several hundred thousand hours worth of use! 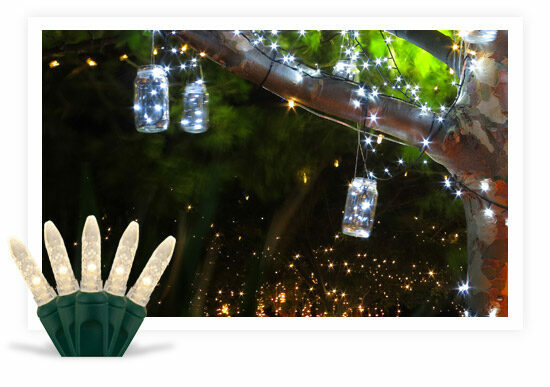 There are also hundreds of LED string lights made with durable acrylic lenses that won't shatter if dropped. 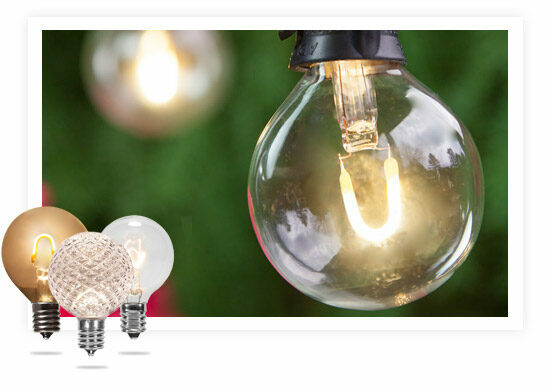 LEDs are available in glass bulb varieties as well, but for outdoor jobs these shatter resistant acrylic LED bulbs can be a real time & budget saver! 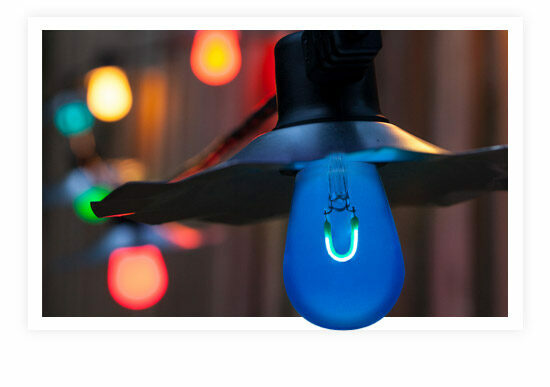 Innovative Designs - LED string lights have an incredible variety of bulb colors and combinations to choose from. Many LED bulbs are dimmable, some have color changing features and some new RGB LED options are even capable of thousands of light color combinations! For those who love the visible filament design once found only in incandescent light bulbs, our new FlexFilament™ LED bulbs feature a visible filament just like those vintage style Edison lights! FlexFilament™ bulbs let you enjoy all the benefits of advanced technology, while providing the traditional bulb design you fell in love with so many years ago. 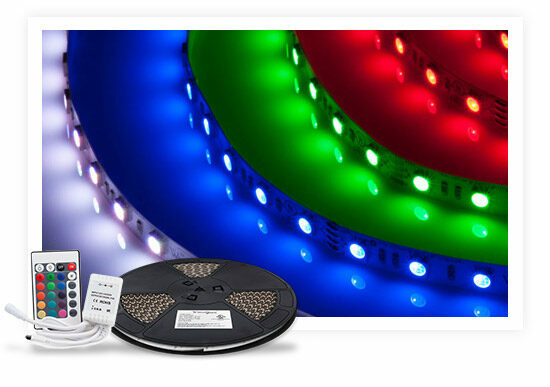 LEDs Excel in Long Term, Large Lighting Projects - In addition to their durability and long life, with many LED string lights you can connect as many as 40 to 50 sets together on one power source, in some cases that means over 1,200 feet of lights! In contrast, when using traditional incandescent light strings you can often only connect between 3-5 strings before you risk overloading your circuit. 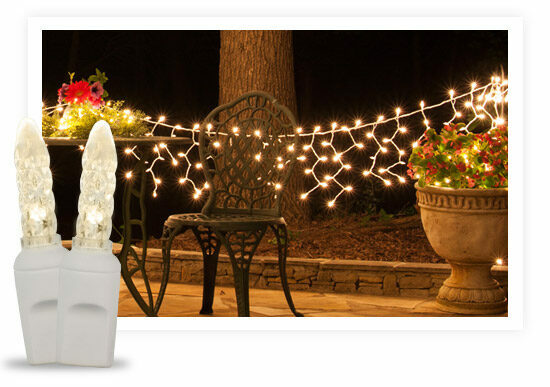 If you previously thought patio lights were only available in incandescent varieties, you're in for a real treat! 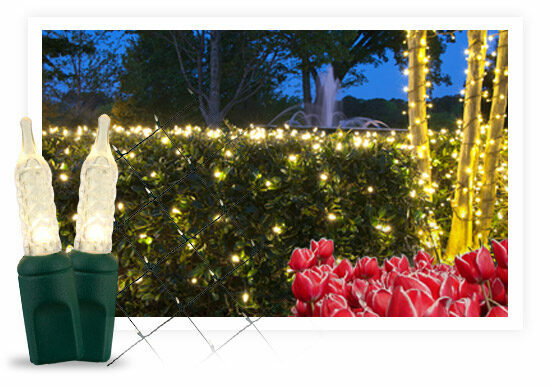 LED patio string lights include globe light bulbs, Edison style vintage bulbs and even C7 & C9 LED light strings. LED Globe Lights are available with both acrylic and glass lenses and a variety of bulb finishes. Opticore™ LED globes have a gorgeous diamond faceted acrylic lens design which creates a brilliant light pattern when hung against solid surfaces. 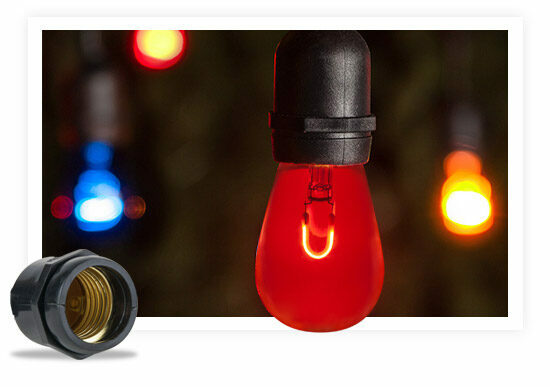 FlexFilament™ LED globe string lights are available with both acrylic and LED lenses. Choose from satin finish FlexFilament™ LED bulbs for a diffused glow and a light bulb that looks as beautiful during the day as it does at night. Or, opt for transparent FlexFilament™ LED string lights and become mesmerized by the eye-catching visible filament design. 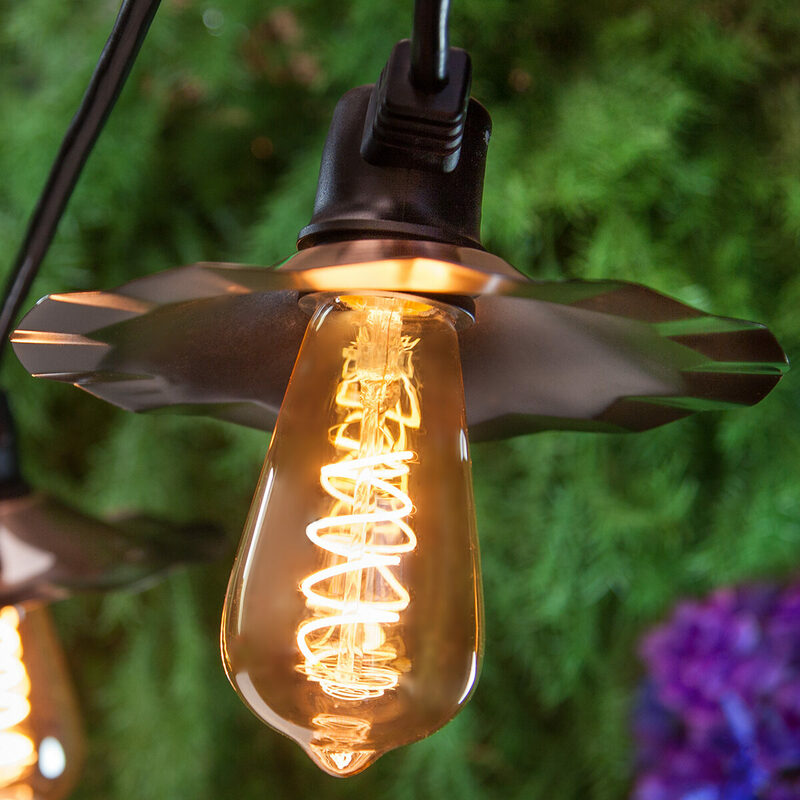 Edison LED String Lights feature two main hallmarks: a visible filament and an elongated bulb design. As mentioned above, transparent Flexible filament LED bulbs have a clear lens which allows for an unimpeded view of the beautiful filament design within. 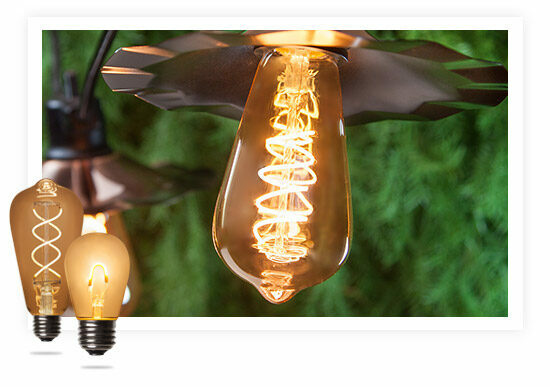 Some Edison LED string lights also have a slight antiquing on their lenses to further enhance their vintage charm. 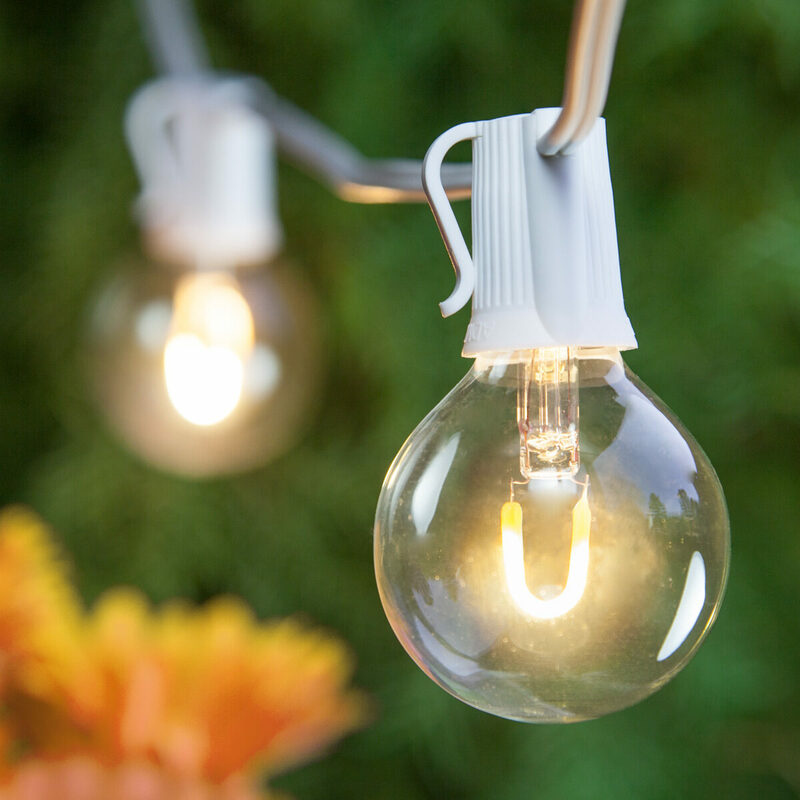 C7 & C9 LED String Lights are often considered a staple in Christmas lighting, however these bulbs are perfect for outdoor patio lighting too! 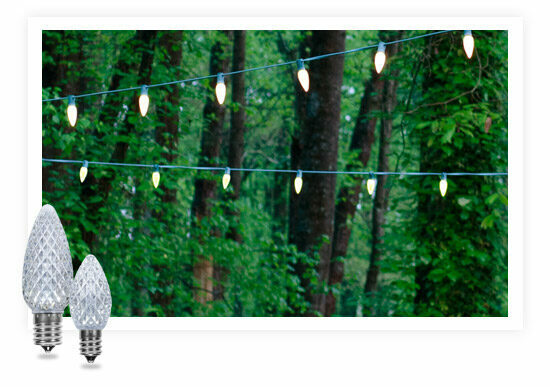 Red, White & Blue C7 & C9 led string lights are a popular choice for summer parties and outdoor events. 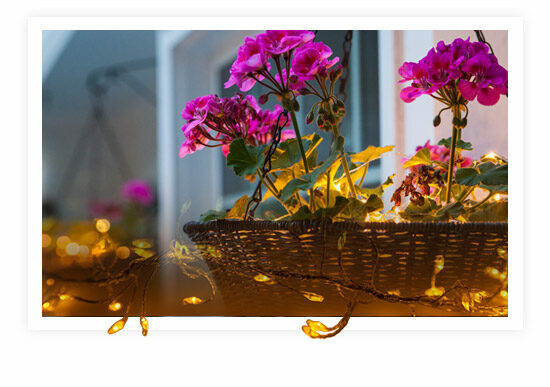 5mm LED Mini String Lights- These tiny bulbs are smaller than incandescent mini lights, but their wide angle concave lens design produces bright light that is dispersed uniformly in all directions. 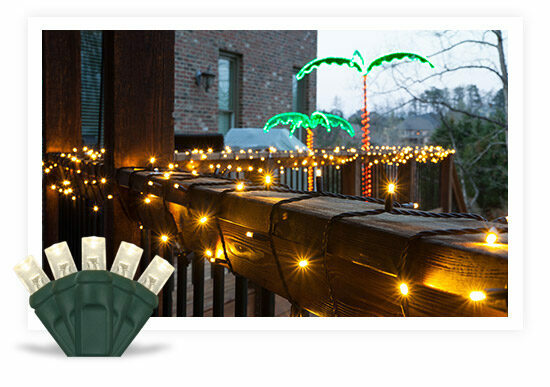 5mm LED string lights are popular for almost any wrapping application including deck railings, columns and outdoor trees. 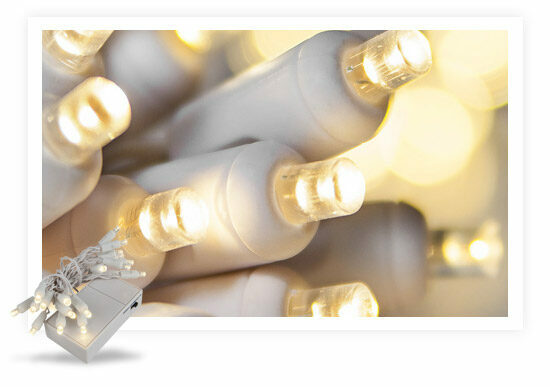 M5 LED Mini Lights & T5 Mini Lights- These lights are very similar in size to incandescent mini lights. M5 bulbs have a faceted lens design, while T5s are completely smooth to exactly mimic the design of traditional mini lights. 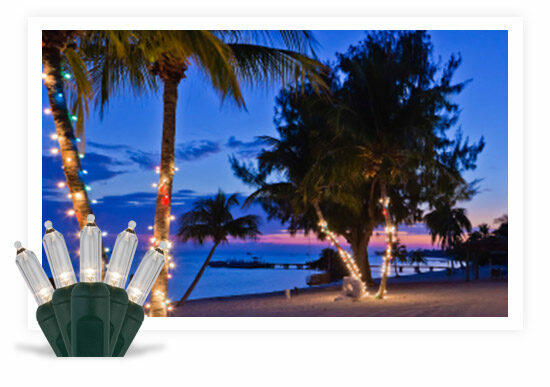 C6 Strawberry Lights- This little known bulb is incredibly versatile for outdoor lighting projects! C6 LEDs are perfect for illuminating bushes, columns and trees because of their unique strawberry shape. 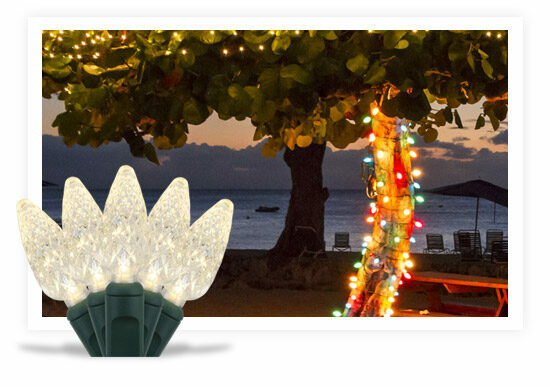 This bulb design is very elegant, perfect for adding ambient lighting to outdoor dinner parties and special events. 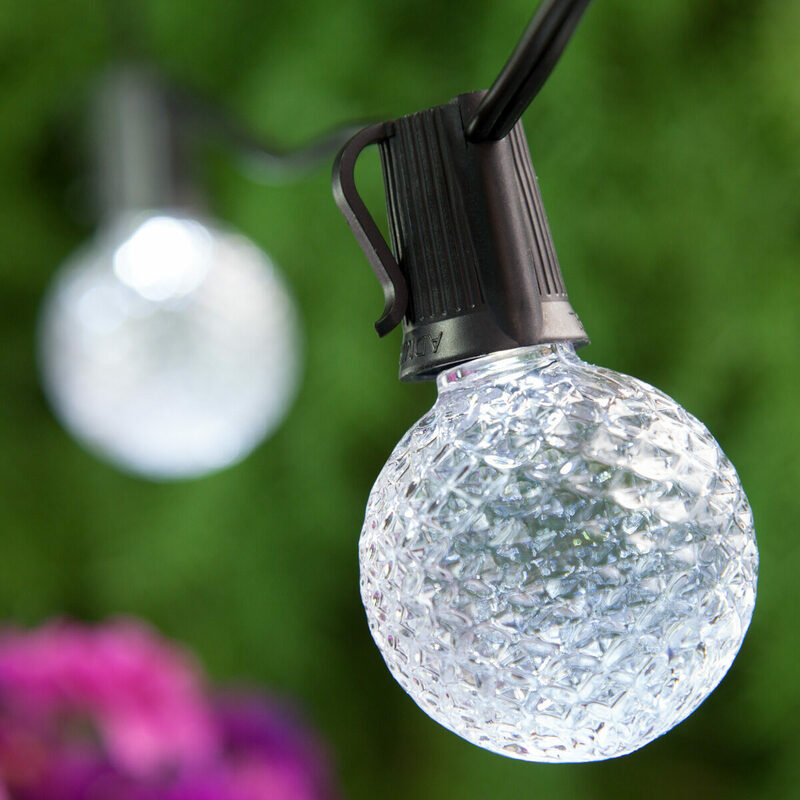 G12 Raspberry Lights- Often said to resemble gumdrops, G12 LED mini light strings are a really fun addition to any outdoor party! 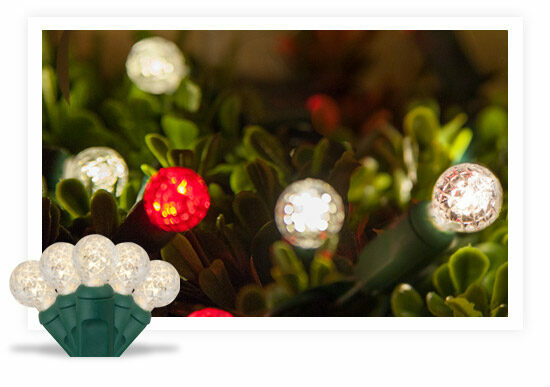 Use G12 LED string lights just like you would any other mini lights - they're especially charming when wrapped around bushes to look like small berries!